Whether you prefer subtle shades or eye-popping hues, you’ll be blown away by the stylish Honda Odyssey colors available for 2019. While drivers will love choosing between eight gorgeous paint options, the high-tech Honda Odyssey features inside the cabin might be even more captivating. Let’s take a deeper look into the the Honda Odyssey specs for the latest model, and feel free to take a sneak peek at our Odyssey inventory online. Beyond the good looks of the Honda Odyssey exterior, the interior is packed with amenities to make your daily drive even better. 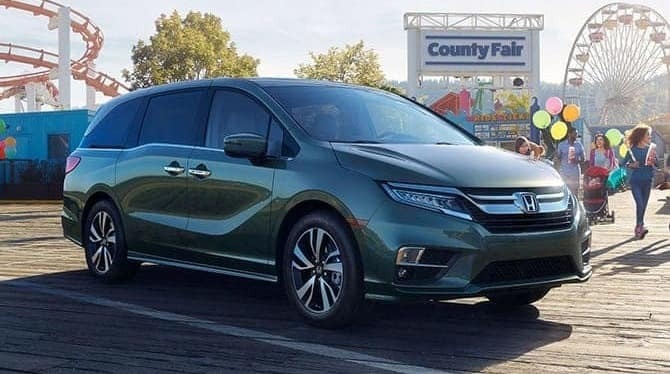 What are some of the Honda Odyssey features available for 2019? Honda Sensing is a suite of smart safety features that incorporate the latest in driver-assistive technology. From Collision Mitigation Braking Systems to Adaptive Cruise Control, driving safely has never been easier. Navigation is offered on higher trims to help you find your way to any destination. This Garmin-based system provides 3D renderings of terrain, HD digital traffic alerts, and much more. The Rear Entertainment System is perfect for long road trips with the little ones. A flip-down screen plays everything from CDs to DVDs to Blu-ray Discs on a 10.2-inch color screen, so passengers can enjoy hours of entertainment on the go. Are you ready to compare this minivan to the Toyota Sienna or pick out your favorite Honda Odyssey colors in person? Check out Patty Peck Honda in Ridgeland to get acquainted with the impressive Honda Odyssey features up close. We’re only a short drive from Madison and Flowood and our experts would be happy to take you on a test drive in the models of your choice, so contact us for all the details.